My gorgeous pair are now 12. It doesn’t seem but a moment ago that I was holding just over 10lbs of babies. Lady Baby came out 4 minutes before BoyChild. She was 4lbs 5oz and he was 5lbs 14oz. I called them FatBoy Slim (still do really). 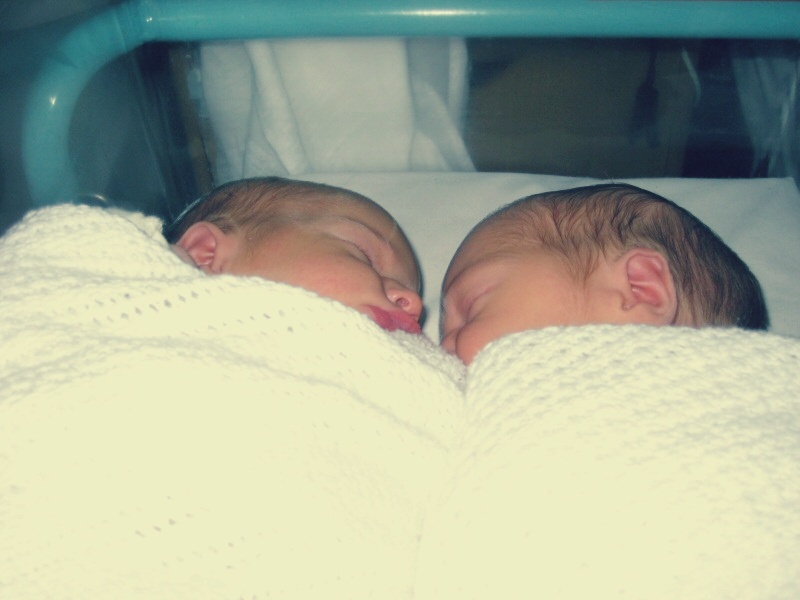 They were born via caesarean section at 36 weeks and 5 days. My blood pressure was very high and they had an a tendency for spinning. My gorgeous consultant, Gaye Henson (retired), was keen for me to have a vaginal birth, but that was not the way that they were to be born. Finding out that you’re pregnant with twins can be exciting and/or overwhelming. Healthcare professionals, friends and family can sometimes make you feel like it is going to be the hardest thing in the world. Your pregnancy is dotted with decisions. I find the whole process exciting and thrilling. I love talking about the possibilities, rather than the restrictions. I love watching clients discover for themselves the options that they have. When we meet, we meet early in the pregnancy and we talk about how my client wants to birth her babies. We talk about the risks and the possibilities. We open up the options that sometimes haven’t yet been shared. We establish the red flags, the lines in the sand and we relish the ongoing journey. It’s not just about the birth. There are the post birth days. Supporting a new mum as she feeds her babies, watching her delight in them. Sending her (and her partner) back to bed whilst I make lunch and supper, these are things that I love. I remember when friends appeared at my door with no interest in me or the babies (lots of people liked to hold and coo at the twins). They arrived with a bucket, rubber gloves and cleaning products. They cleaned my bathroom and my kitchen. When they left, there was food cooking in the oven. It remains one of my best post birth memories. I love being a twin doula. For me it’s all about the double blessing. Why I think black women, brown women, women of colour, need their own space to talk.